Shane Shirley : Is Your State Going Green? Is Your State Going Green? Is Your State (in orange) on this List? If the inability of our Congress to enact safe toxic chemical laws has you wondering what the heck we, as a nation, are supposed to do to protect ourselves, wonder no more. Some states are going green! 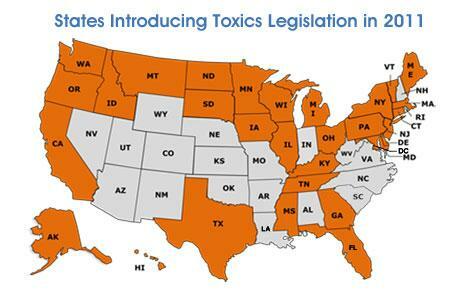 It seems that some states are taking unsafe chemicals to task and stepping in to get the job done. Now I appreciate the benefit to having as little regulation as possible on industry to help our economy thrive, but when it comes to toxic chemicals in our consumer products, industry is not doing their job to protect the very people who put money in their pockets. I have come to believe that regulation is necessary to protect our future health and the future health of our planet. Getting the word out to protect consumers is not doing the job. In my opinion, far too many folks are too busy worrying about how they are going to put food on their tables to be able to take the time to educate themselves on what toxic chemicals are lurking in things like their cleaning supplies. Just because some consumers might not have the luxury of time to become educated on this topic (and thus make better informed decisions), they should not have to suffer the consequences because they don't have all of the information. Oh I can hear Rush Limbaugh now (well not really but, as I do most days, I will be listening to him later) bashing the hell out of any regulation. Perhaps I am way off base here but honestly, I often wonder how educated he is about unsafe chemicals in our consumer products and their impact on human and environmental health. You know not all greenies are extremists and anti-business. It is just such a slippery slope. I mean I totally agree with Rush about Al Gore being an Eco-nut job but would he think differently about toxic chemical industry regulation if he were educated on this particular issue? He reaches so many people each day and, like Mike "the Situation" Sorrentino, it would be great if he could impact his audience in a positive way to live greener. "The American public is demanding new chemical safety laws, and state elected officials – both Republicans and Democrats – are responding," said Andy Igrejas, Campaign Director of the Safer Chemicals, Healthy Families coalition. "At some point Congress will wake up and realize it is better for industry and public safety to make these changes at the federal level, as well." "A substantial body of scientific research shows that the public is exposed to chemicals that increase the risk of serious health threats, including cancer, asthma, infertility, and learning and developmental disabilities," said Dr. Ted Schettler, MD, MPH, Science Director of the Science and Environmental Health Network. "For most chemicals, no Government agency has the authority to require safety testing before they are put into widespread use. It's an uncontrolled experiment, and individuals and families across the country are paying the price." Bills to be considered in the 30 states include: bans on BPA and hazardous flame retardants in consumer products; requirements that children's product manufacturers use only the safest chemicals; and resolutions urging Congress to overhaul the 1976 Toxic Substances Control Act (TSCA) – the federal law that allows dangerous and untested chemicals to be used in everyday products and materials.